Leicester City Football Club is delighted to announce that midfielder Danny Drinkwater has signed a new four-year contract with the Foxes, keeping him at King Power Stadium until June 2018. Drinkwater, the Club's Player of the Year during the recent Football League Championship-winning campaign, was due to enter the final year of his existing contract in 2014/15. The 24-year-old playmaker was a key figure in City's march to their first ever Football League title and return to the Premier League, making 49 appearances for Nigel Pearson's side in all competitions last season and scoring eight goals. His consistently high levels of performance saw him finish third in the voting for the Football League's Championship Player of the Year, while he was also named in the PFA's Championship Team of the Season along with team-mates Kasper Schmeichel and Wes Morgan. Danny told LCFC.com: "I'm absolutely delighted to commit my future to Leicester City. The Club and the manager have shown a lot of faith in me since I joined and I've never enjoyed my football more than I did last season. "It's an exciting time for the Club, going back into the Premier League. We've worked extremely hard to get there and I'm really looking forward to being part of the journey in the next four seasons as we look to establish the Club back in the top flight." Drinkwater joined City from Manchester United in January 2012 following successful loan spells with Barnsley, Cardiff City and Huddersfield Town. Since then his stock has risen beyond the heights most could have expected. A key player in City's push to the playoffs during his first full season in 2012/13, the talented midfielder took his game to a different level in 2013/14, becoming one of the most influential players in the Football League. His campaign started with a crucial equaliser in a 2-1 win at Middlesbrough on the opening day and Drinkwater never looked back. Man-of-the-match performances against Queens Park Rangers and Bolton Wanderers over the Christmas period helped guide City to the top of the table, a position they never surrendered en route to the title. 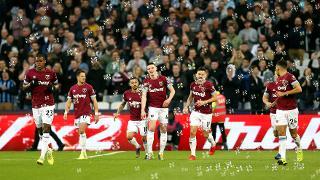 - which would later be voted the Club's Goal of the Season - salvaged the Foxes' long unbeaten run at a crucial stage of the campaign and will be forgotten by few that saw it for many years. The heartbeat of the team on so many occasions throughout the campaign, Drinkwater's influence is probably best represented by the phenomenal number of successful passes he made during the 2013/14 season, 2469 - over 600 more than any other player in the Championship. All told, he attempted a league-high 2,992 passes at a completion rate of 83 per cent. Quickly identified following the manager's return to the Club in late-2011, Drinkwater was one of the earliest permanent signings of Pearson's second spell in charge at Leicester. The Manchester-born midfielder has since made 114 appearances for the Club, scoring 11 times.